Even though the house at 38 Krier Lane is a little more than 4,000 square feet, it is surprisingly cozy. Tucked inside I-on, one of Mount Pleasant, South Carolina-s most desirable neighborhoods, it is everything you would expect from a gracious Charleston home - and more. Built in 2005, this lovely Charleston single is home to Miriam Ricks, a well-known interior designer, and her son, Jordan, a second-grader at Palmetto Christian Academy. Custom built for the Ricks family, the house was supposed to be smaller, but, when Miriam saw a similar home in I-on, she knew this floor plan would be ideal. "I loved the reverse floor plan," Miriam says. "And the home really fit the lot perfectly." The plan features the main living space on the second floor, with a spacious living area, large eat-in kitchen with marble countertops and a separate dining room. Also on the second floor is the master bedroom suite, a sanctuary with a private bath and large walk-in closet. Upstairs is Jordan-s domain. Originally planned to be an attic, the Ricks- decided to finish the third floor, which includes two bedrooms and a full bath along with an extra room that can serve as a media room, playroom or office. 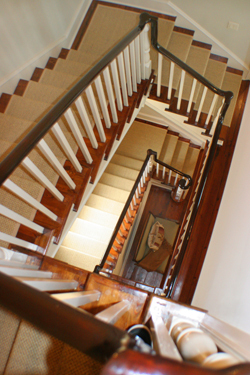 The first floor includes two guest rooms, each with a full bathroom, off the foyer. A two-car garage provides ample parking. An interior designer, Miriam prefers a "very neutral and soothing" look, a style that she offers to many of her clients. "I-ve worked on many large homes at Kiawah," Miriam says. "I like restful colors that allow the outdoors to shine." 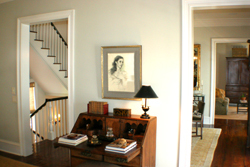 The muted colors lend a casual yet elegant look, which is enhanced by the European antiques she favors. "I mostly shop the antique shops on King Street," she confides, admitting that she also looks for antiques for her own home. "I find so many beautiful things there. I also love the light fixtures in this house. Most of them are from Urban Electric." "I-m always so busy that, when I come home, I want a soothing place," she continues. Miriam has indeed been busy over the last few years, with her clients and the challenges of everyday life. 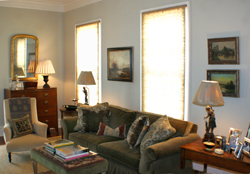 That-s why her home features historic Charleston colors, creating a wonderful place to unwind and read to Jordan. This cherished home is now for sale, as Miriam and Jordan prepare to create new memories in their next home. It might be smaller, but it will be just as inviting as 38 Krier Lane. There-s no doubt.